It was an odd feeling not to wake up starving for the first time in weeks. Kat had expected to be woken up with an aggressive stomachache, like every day, and dread getting out of her nest. But today was different. Perhaps it was not the more advanced and effective hunting techniques that changed the morale of the Clan and her as of late–it was the hope that resulted. Kat dragged herself to her paws, stretching out. Still half asleep, her jaws split into a gaping yawn. Something cold hit her neck, and with a surprised wince she realized that it had begun to rain. The makeshift roof had not been enough to contain a few raindrops, and Kat silently prayed that it was just going to be a drizzle. Kat ungracefully tiptoed over the other bodies of her Clanmates, uttering the occasional “oops” and “sorry” for every limb she stepped on. Needless to say, she woke up a few disgruntled warriors. She dashed out of the den before anyone could make a bitter remark. “You’re up early,” came a voice behind her. Kat spun around clumsily and finally recognized the owner of the voice. Copperclaw. Copperclaw seemed to have been awake for a while, or she at least did compared to Kat. Kat nodded a response. “Believe me, I’m just as surprised as you are. When I was a human I would get up at–” Kat so wished she could bite back those words, but they spluttered out. Copperclaw looked unsettled, as did a few of the apprentices sitting near her. “Take some warriors of your choosing and some apprentices outside the camp–in that little hollow outside camp–underneath the willow tree. See if you can teach some hunting techniques–you and Jayfrost,” Copperclaw said, diffusing any tension. Kat dipped her head. “Of course,” replied Jayfrost, who had just finished collecting more moss for her nest. Elkheart followed behind her, beaming. Iceshard bounded across a few warriors towards the entrance. Why am I acting like such an idiot? What is going on? For once, everything is working out…why does it not feel that way? “We have to learn in the rain?” groaned Applepaw. 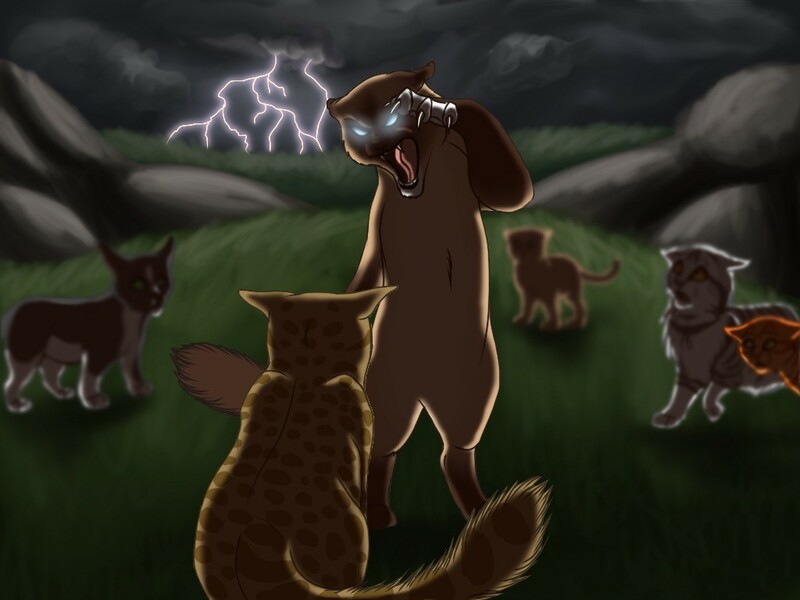 She, Stormpaw, Snakepaw, Cypresspaw, Honeypaw, and Olivepaw dragged their paws along the ground while following the warriors out of camp. By the expression she got in return, Kat knew that she may have scared the apprentice more than getting her excited. She exchanged a nervous look with Jayfrost as she continued down the path. “What if we get eaten by the badger?” asked Olivepaw, shivering. There was a few moments of silence following. Elkheart finally spoke up. “Badgers don’t come out in the rain…they’re uh…afraid of thunderstorms,” she said. All of the warriors nodded to each other in agreement. The apprentices were still skeptical. Kat steered them all into the area under the huge willow tree. Only flecks of rain seeped through the dense branches. After a few more measures of convincing, the apprentices soon calmed down enough to sit down. The four warriors sat on a rock next to the trunk of the tree. “So. You all would probably like to know how to hunt better than before…and learn our super secret tactics,” Kat began not-so-steadily. She was beginning to shake in her paws. How am I going to present this? Waddle through the forest and hope you trip on prey? Before Kat could sink herself deep into embarrassment, she heard a sorrowful sound from the apprentices. She saw Iceshard rushing over to Cypresspaw, who was starting to shake with tears. Before long, almost all of the apprentices started to cry. Elkheart was looking down in a dangerously serious way. Jayfrost was staring off into nothingness. Iceshard was biting his lip. Kat felt like her whole body was blowing up and waiting to explode with emotion, but, for the first time, she held back. She had to be brave for the apprentices. She had to be a senior warrior. But there were no words that she could offer to comfort them. Kat turned to the other warriors. They all quietly mumbled an agreement. But there was something very hollow in her words. Kat did not feel as if she believed the words themselves. The group headed back to the camp. Rain had begun to come down a bit harder than before, but it was not yet pouring. The sky was completely blanketed with gray clouds. Only slivers of sunlight seeped through thick fog. Copperclaw was confused, but quietly understood once Jayfrost explained it. The apprentices went back into their den. Kat was about to escape back into the warriors’ den to sleep but a voice from the cliff above Cakestar’s den called her back. It was Copperclaw, with Cakestar beside her. Cakestar’s lion-like mane covered her paws as she lied down gracefully. Her eyes were shut, and her head was bent forward. Kat doubted that she was even awake. It killed her to see the once confident and regal leader now reduced to being weak and shaking in the rain. Dawnmist sat, unsettled, next to her apprentice by her den. She watched Cakestar like a hawk. Her eyes did not waiver from the leader. Silverwind bumped her friend and mentor gingerly, hoping to draw her attention, but Dawnmist did not lose focus. Flame, Flowerstream, and a few other warriors gathered beneath the highledge. Several apprentices joined their mentors. Copperclaw finally continued. If Copperclaw was still talking, Kat didn’t hear it. Her mind wandered off to somewhere else. She started foraging in her mind for memories of being a human. To be at ease. She remembered her sisters and brother. She remembered her parents. She remembered feeling loved. She remembered being happy. She remembered having a full stomach. She remembered being taken care of. She remembered peace. And she missed it all. There was a gaping hole in her heart that could not be filled. And then anger ensued. Anger that did not belong to her…anger that was purely feline. Purely instinctual. Hope was futile. How many times were they going to keep repeating the same words and pretend that everything’s okay? How many times is the word “hope” going to pretend Cakestar’s illness doesn’t exist? How many times were they going to pretend that cats–no–people aren’t dying? The camp grew to a quiet, besides the sound of the rain falling down, now more fiercely than before. Everyone looked to Kat, who would have been embarrassed, but now looked fiery. She must have seemed to be a completely different cat to some, who usually saw her as a clumsy, lazy, bobtailed clown. Her fur stood on end, and her pupils were slits. Copperclaw closed her mouth, ears flattening. Kat’s claws were unsheathed. Copperclaw leapt down. She was evidently confused by Kat’s change in attitude, but dismissive. “Listen, I was just as skeptical as you were. But we have no other choice. We can either stay together and have a chance at surviving, or break up and perish. Your choice,” Copperclaw replied. Cats had begun to shuffle behind Copperclaw, while others stayed behind Kat. “Kat, calm down,” said Shiningspirit from behind Copperclaw. Some cats had begun to think, but no one said a word. Copperclaw must have remembered, because she remained calm. Her eyes did not move from staring at Kat. Copperclaw had stepped forward and offered a paw to Kat to try and talk, but that was when instinct took over. A crack of thunder echoed, and Kat’s unsheathed claw swiped across Copperclaw’s face. Blood splattered on the ground. Flashes of lightning lit up the newly shed red blood. Copperclaw nearly succumbed to hissing and snarling, like a real cat, but stopped herself. Kat stepped back. Her head shook and she blinked. It was then that she came back to her senses to see blood on her paw. Eyes were all glued to her as if she had six legs. “What did I…Copperclaw–Copperclaw I’m so…sorry–I didn’t–I can’t-” Kat spluttered. Copperclaw used her forearm to wipe the cut on her cheek. Silverwind rushed over with herbs. The thunder crackled once again, and Kat ran away in fear. She needed to hide. Far away from anyone else. When she found a snug tree hollow to curl up in, Kat could only hear her rapid heartbeat against heavy rain and thunder. She covered her eyes with her paws. I…I’m losing my humanity..! She whimpered pitifully. What if…what if I’m only the first? 43 Responses to "Trailing Stars, Chapter 16; by Kat"
Could I maybe be added into it? Just noticed I’m in this chapter! 😀 Thanks Kat!